Joint custody is a family law term that refers to a child custody arrangement in which both parents share the decision-making responsibilities and physical care of the child. Joint custody arrangements are often made during divorce proceedings, at which time they are defined by a court order. The exact terms of joint custody depend on the situation, as well as the plan created by the parents, or the determination of the judge presiding over the case. To explore this concept, consider the following joint custody definition. noun. Custody of a child in which two or more people share responsibility for the child. The law recognizes that every child has the right to have a close relationship with each of his or her parents, even if the parents are separated or divorced. The term joint custody refers to a legal classification for how the parents share responsibilities for, and care of the child. Ideally, both parents would be equally responsible for the child, but in reality this often does not happen. Parents who are unable to work out a shared custody arrangement that works for them, and for their children, find themselves in the family court system. In deciding custody matters, the court looks primarily at what is in the best interests of the children. There are several types of custody arrangements that may be ordered, each a variant that includes both legal and physical custody. Legal custody refers to the right and responsibility to make decisions on important issues in the child’s life, such as medical care, education, and religious upbringing. Physical custody refers to where, and with whom the child will live primarily, or perhaps solely. The court begins the investigative process with the belief that parents should equally share both legal and physical custody, which is referred to as “joint custody.” Depending on the outcome of the investigation, that may change. Once a court issues a child custody order, it becomes binding by law. In ancient Rome, children were seen as property that was owned by their fathers. This concept of ownership gave fathers the power to sell their children, or to enter them into the slave labor trade. During that time, women had no authority or rights over their children, and the belief that children were property continued through the 19th century in many regions of the world. Under English common law, fathers were obligated to provide support for their children, and to raise them as they saw fit. Divorce was uncommon in that era, but if a man put away his wife, she was allowed only restricted access to the couple’ children. It wasn’t until the mid 1830s that British courts began awarding mothers custody of very young children. Older children still remained with their father, with the m other being allowed limited visitation rights. The theory behind this was that very young children needed “mothering,” while older children needed the hand of discipline given by their father. By the early 1900s, in the United States, child custody issues began to change as courts began recognizing the mother as the better choice for raising children of any age. For decades, it was common for courts to award custody to the mother. By the 1960s, things began to change once again. Men began fighting for their parental rights, and the courts began accepting the fact that every family’s situation was different, and that different custody arrangements were necessary to ensure the best interests of the child were attended to. Child custody laws can be confusing as there are many legal terms involved. It is commonly believed that joint custody means that both parents have equal rights to the child in all aspects. In reality, there are two types of joint custody, legal and physical custody. These are separate issues that deal with how the parents are to handle primary care, visitation, financial support, and other issues regarding the child’s well-being. 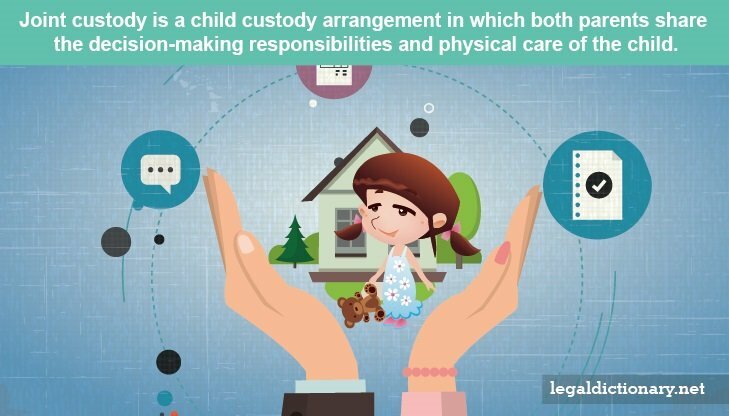 In all jurisdictions, joint custody is preferred, as it provides children with the opportunity to connect with, and be raised by, both parents. In some cases, one parent is unable to provide these things, leading the court to favor the other parent in certain respects. Physical custody is the day-to-day care for the child, which occurs at the child’s home. This includes such activities as providing meals, clothes, toys, and other items, ensuring the child attends and does well in school, helping with homework, providing discipline, and generally seeing to the child’s needs. This may occur in both parents’ homes, as the child goes back and forth. Ideally, the child spends a nearly equal amount of time with both parents when they are available to take care of his or her needs. Regardless of who the child primarily lives with, the concept of joint physical custody is to ensure that children have frequent contact with both parents. When Bob and Mary divorced, Mary remained in the home they bought together, and Bob moved to an apartment across town. In order to keep the children in the same schools they attended before the divorce, the couple decided that the children will live with Mary in the family home. On the weekends and one day during the week, the children will stay with Bob. Legal custody refers to the rights and responsibilities of making important decisions in the children’s lives. These decisions include such issues as daycare, schooling, religion, and healthcare. When parents have joint legal custody, they must consult with one another before making such major choices for their children. Joint legal custody may be ordered even if one parent has primary or sole physical custody. IN fact, it is somewhat uncommon for the court to deny one parent joint legal custody, even in such circumstances. When John and Trish divorce, they cannot agree on custody issues. John’s job requires him to travel frequently, so the court decided the children would live primarily with Trish, with John having visitation every other weekend. The couple held joint physical and legal custody. John was still angry about the circumstances of their breakup, so he argued with his ex-wife over every little thing, including the decisions she made about small issues at school and after-school activities. He also attempted to argue with Trish over regular healthcare appointments for the children. When John took his complaints to the court, his constant antagonism and quarreling was seen to be disruptive to the children’s wellbeing. The judge did modify the custody order, specifically counseling John to refrain from making any negative statements about Trish or the custody arrangement during his visitation time, or any time the children might be present. The judge also granted Trish sole legal custody, as he determined that John was unlikely to make important decisions based on the children’s needs, rather than his own anger. When parents separate or divorce, the issues of where the children will live, and when parents will have time with the children is specified in a parenting plan. Parents how are able to work out such details, and work together to parent the children, are not required to go through the courts to obtain a custody order. It is still a good idea to put the plan, including how important decisions for the children will be made, in writing. It is when parents cannot agree on custody issues that the court must become involved. In many jurisdictions, a court-appointed mediator assists the parents in coming up with a plan that works for everyone, with a primary goal of ensuring the best interests of the children. In most situations, the parents agree to the terms of the recommended parenting plan, but if they are unable to agree, the court may make an order, which is usually based on the mediator’s recommendations. Regardless of how the parenting plan was created, once made an order of the court, it is legally binding. It is most common for the non-custodial parent (the parent with whom the children do not primarily live) to pay support to the custodial parent. It is possible, though not common, that a custodial parent with an income that is very high in relation to the other parent’s income, would be ordered to pay at least a small amount to the non-custodial parent. This is because the court does give some consideration to maintaining the children’s standard of living experienced prior to the parents’ divorce. The primary difference in child support ordered in joint custody is the percentage of time each parent has with the children. Where a parent has only supervised visitation, or no visitation at all, 100 percent of custody time is awarded to the custodial parent where child support calculations are concerned. Where parents share custody close to 50/50, the calculation may come down to each parent’s income level. In such an example of joint custody, where there is not a significant difference in income, there may be no child support ordered at that time, though the issue can always be revisited. Like the parenting plan, child support is legally binding once the court has ordered it, and failure to make payments can have serious legal implications. In 2008, Michelle Rivero and Elvis Rivero divorced, and a custody order specifying the child would live with Michelle five days of the week, and with Elvis two days of the week. The court order called this “joint custody,” even with the obvious weight of the custodial time with the m other. Based on the designation of “joint” custody, the judge declined to award child support to the mother. Michelle filed a motion with the court requesting that child support be awarded. The judge at the time, without even reviewing the percentage of time awarded to each parent in the existing custody order, but based on its designation as “joint custody,” denied Michelle’s request. Michelle attempted to have the judge removed from the case, at which time the judge reviewed the custody time, stated it should be closer to 50/50, and ordered the parents to mediation. When the parents could not reach an agreement at mediation, the judge changed the joint custody order to give each parent equal time with the children. Michelle appealed her case to the Nevada Supreme Court, asking that court to review the issues of whether the label of joint custody itself should apply to child support obligations, the unrequested modification of the custody order, denial of the mother’s motion for child support, and the family court’s refusal to recuse the original judge. The Nevada Supreme Court found that the definition of joint physical custody should focus on the fact that each parent would be spending a significant amount of time, and have meaningful contact with the child, with no actual regard to the specific timeshare amount. It then ruled that the family court had abused its discretion in denying child support based solely on its finding that the parents had “joint” physical custody. The Court then ruled that the family court had been wrong in modifying the custody order without first determining whether the modification was in the child’s best interests. And finally, the Court addressed the appropriate formula for making child support calculations when the parents have joint physical custody with an unequal time division. Divorce – The dissolution of a marriage.